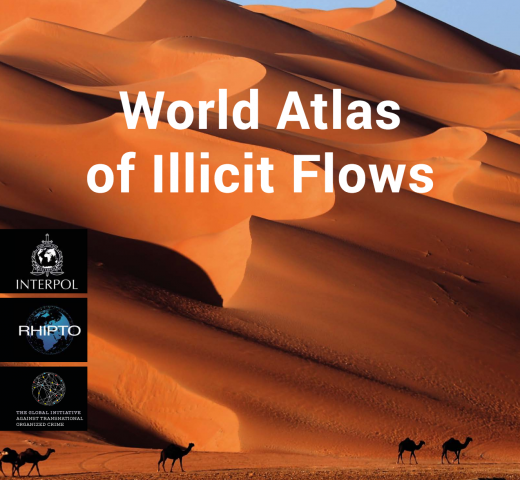 Recently, the library cataloged an electronic version of The World Atlas of Illicit Flows. This 152-page document was introduced on the margins of the 73rd United Nations General Assembly on September 25th. Its creation was possible due to the collaboration between INTERPOL, RHIPTO Norwegian Centre for Global Analyses, and the Global Initiative. Through outstanding charts and graphs, the atlas illustrates how transnational organized crime has infiltrated every corner of society worldwide, exploiting governance weaknesses during local conflicts and sustaining non-armed groups and terrorists. The document provides the first consolidated overview of illicit flows and their significance in conflicts worldwide. There are over a thousand smuggling routes worldwide of goods and services associated with environmental crime, drugs, and people. Twelve chapters illustrate an atrocious scope of the catastrophe of transnational organized crime, including environmental crime, which is more lucrative than human trafficking. It provides more than a third of income that finances the largest armed groups. Two other big groups of sources for armed groups are illegal trade and exploitation of fuel (20 percent), and illicit taxation and extortion (17 percent). Twenty-eight percent of these groups’ income is derived from production, trafficking, and taxation of drugs. The largest, least risky, and most profitable illicit environmental industry is illegal logging. Other crimes in the World Atlas of Illicit Flows includes illegal wildlife trade; in the document, we learn that pangolins are the world’s most trafficked animals. Human trafficking is also covered; economically speaking, it is the fourth-largest global crime sector, with an estimated annual market value of at least US$157 billion. The Global Initiative Against Transnational Organized Crime, one of the sponsors of the World Atlas of Illicit Flows, is a non-for-profit organization that attempts to regenerate the debate around countering organized crime, illicit trafficking, and trade. Established about seven years ago, this network of experts around the world grew rapidly, including experts in law enforcement agencies, law practitioners, senior officials in international organizations like UN and INTERPOL, academics, and civil society organizations. It encourages free thinking and debate, looks at the problems of trafficking and illicit trade from new angles, mobilizes political will, and creates new ideas. The Global Initiative website has an abundance of information, research publications, policy briefs, infographics, and more. The research publications can be searched by topic, type of document and type of crime. The Global Initiative is a young organization that has big potential and is already influential in the international arena. Its website should be bookmarked by students learning about international criminal justice, terrorism, economic and environmental crimes. The Global Initiative’s recent environmental crime projects include a search engine that deconstructs law into data, setting the foundation for an unprecedented ability to conduct smart searches within the laws, compare key legal concepts among jurisdictions, and assess the quality of legal systems to effectively manage societal challenge. Another initiative, UN-TOC Watch, seeks to monitor and analyze how the UN System has been responding to organized crime in the period 2012-2017. There were 1,113 UN Security Council passed resolutions analyzed in reference to different types of crime. The findings are just hot off the press, titled Organized Crime and Its Role in Contemporary Conflict: An Analysis of UN Security Council Resolutions. The collected data can be further explored by the region and type of crime.